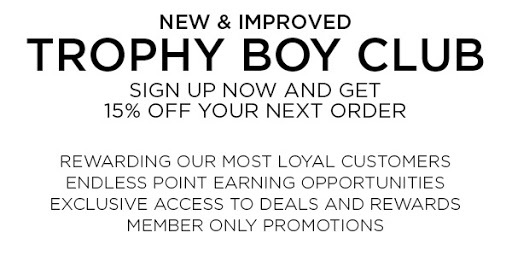 We designed our Trophy Boy Club to give you even better value for being a loyal customer. Start earning points today. Earn points for every dollar you spend on our site. Watch how quickly they add up and redeem them for exclusive rewards. Like what you see? Tell your friends about our great products! Purchase points must be earned annually to maintain Trophy Boy Club level. If points earned do not qualify to maintain current level, member will be lowered to the next qualifying level based on that years purchase points.